Havn't posted on the forums in two years. Lot of stuff has happened. My last project was called Mangrove Valley which I was doing in RCT3. Since then, I got a new computer and transfer didnt go too well so I dont have that file anymore. Really been enjoying seeing how Parkitect has developed so I thought I'd give it a crack. I started this park primarily to get familiar with the game mechanics and existing scenery. As such, I won’t be using any mods for this park. 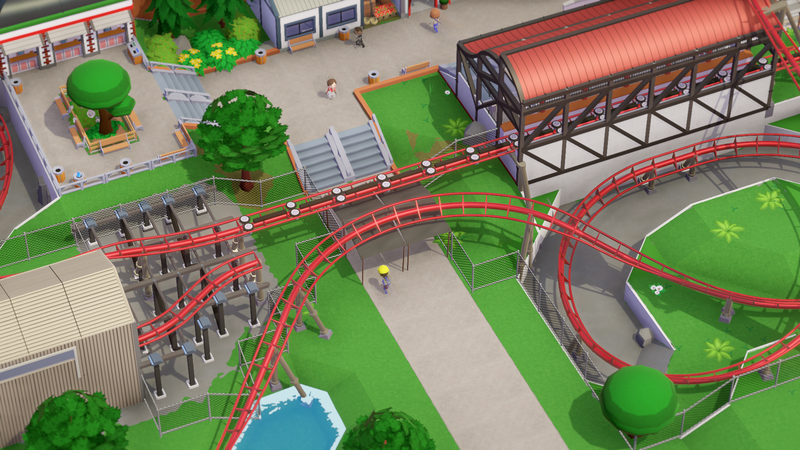 I don’t have a computer beefy enough to run a game like planet coaster (I tried) but parkitect works really smooth so far as long as I turn off shadows and occlusion when im building. I also kept the map intentionally small to start off with. The main inspiration for this park was a medium-size park in New Zealand called Rainbow’s end. Only has a couple coasters and themed rides but its all really tightly packed. I started off with the back end of the park which contains the Thrill Zone area. I might be shooting myself in the foot by starting at the back of the park but we'll see how it goes. Here’s an overview of progress so far. The entrance to the area passes under the track of our coaster twice! Boosted the decoration rating a fair bit. As you walk through, the transfer track and maintenance shed are on your left, along with stairs up to the Thrill Zone Pizzeria. While you're eating away at some scrumptious Hawaiian pizza, you can watch the train take the last sweeping turn of the coaster before the break run. As you head down to the right, past a staff room, we come to The Parlour, Thrill zone's local ice creamery! There's also a toilet block next door and a coffee cart for those who'd prefer a warmer touch to their day. The backstage area includes the depot for the area, access for the staff to each of the food stations, as well as a staff room. At the end of the strip we find Z-Strike!! (Exclamation marks included in the name) This power surge ride is slightly raised on the terrain to impose dramatically on the strip and also allows riders a great view of the park from high up! (Though they may be upside down at the time..
On the inside corner, we have the station for the park's largest and most thrilling coaster, Renegade! The queue for the ride passes underneath the launch, sure to get the guests brimming with anticipation! An overview of Renegade. The launch leads into an immelman which then wraps around the back of the park before heading up and over the station. It then dives down into some low to the ground turns during the trench run of the ride with a zero g roll mixed in the middle. The coaster then skims out onto the water, through the maintenance shed before one last high speed turn into the break run. We we're able to catch the test train as it flew through the zero-g roll. That's all for the park for this update. However, one little thing to add. I've been really inspired by peanuts comics recently and thought it could be a fun way to do something extra to the park updates by adding a short 4-panel strip i drew with each update. The main idea will be just little slice of life things especially related to theme parks. Hopefully over time, if this works out, i can tell a short story with it as well. Until next time! Let me know what you guys think. Still getting used to the game so keen to learn how to improve on it. Great job on this park so far. You can really do a lot without mods. I do recommend the Perspective Camera mod though, as you can get down inside your park, which can sometimes be helpful when building and you can take some great, peep-level screenshots. And I love the comic strip. I can really relate to that little guy, as that's how I end up after riding anything but the tamest of coasters. I love the coaster trenches. Nice path interaction, too. Very nice work, the coaster looks so smooth. This is a big improvement over the original RCT games is the better track with smoother transitions and banked turns. I was hesitant to get the perspective camera cos i heard it can mess the game if you have it and the POV mod. It seems to be working so far! Thanks Paul! Those low to the ground, high speed turns are some of my favourite elements on Coasters. I know right! Just the fact that I can control how much banking is amazing. Thrill Zone Update 2: Complete! And with this, I have completed the first section of the park. Thrill zone boasts the park's most thrilling coaster along with 3 High-adrenaline rides to keep guests' hair raised indefinitely! Before we get to the newly finished Thrill Zone, there has also been more development close to the lake front. Bumper cars have been installed with a facade to cover the ride. This is attached to the gift shop (Red part of building) sure to provide guests with sweet memories of Kettlefield. The facade will ideally help keep the noise inside. Those cars can get loud. Looks like it will be really lit up at night! Up the stairs from the bumper cars, we have Doom Drop! The tallest ride in the park gives guests a prime view of the surroundings... before dropping faster than they can breathe! You can see Renegade shooting through the zero-G roll in the back ground. Across the street from the Torched Pig is Colossal Force! This ride will have your blood rushing to your head! From here you can see the backstage area that the Torched Pig is hiding. It includes the areas Depot as well as a Staff room and a small area for staff to relax. Next to the backstage area is a small stretch with a bunch of food vendors set up. From Hot dogs to fruit drinks, we've got you covered! Here's an aerial view of the completed Thrill Zone. Here's some peep-view shots from the first part of Thrill Zone. A shot down one of the Thrill streets. Renegade really dominates this area of the park! From here, work will progress into the kid's area of the park (Yet to be named). Future works will include a western themed area and a few generic areas as well. Any comments and feedback much appreciated. Especially anything to do with colour. I feel colour is one of my weaker points in designing buildings & rides. Glad you got the perspective mod. Screenshots look so much better when you're down at peep view. The Chinese Rest. looks great, too. I don't think it needs a second floor, but that's your call. Those oriental lanterns aren't from a mod? I havn't opened the game for a while, so I'm not familiar with all the in-game objects. This park looks amazing! I like all of the detail you are doing and the creativity behind it. I love the way the lanterns in the wall look vaguely mosaic-like, really reminds me of some low-budget park decoration. And I definitely pick up the Rainbow's End vibe, too. Thrill Zone definitely looks thrilling. Renegade looks like a fun coaster and I am sure guests are going to be lining up for hours!